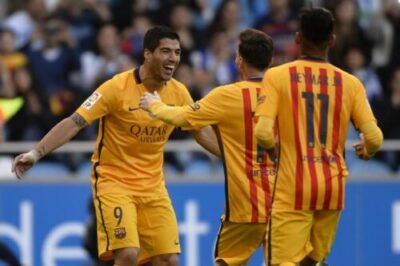 Luis Suárez fired four goals to put Barcelona’s crumbling La Liga title challenge firmly back on track with a 8-0 humbling of Deportivo La Coruña at the Riazor. Barcelona went into the game under huge pressure after three straight league defeats saw their seemingly unassailable nine-point lead atop La Liga wiped away. But Suárez helped ease the nerves in style on Wednesday with two goals in each half to take his season’s tally to 49 goals in just 48 outings. Completing a night to remember for the Uruguayan, he also got a ht-trick of assists, for Ivan Rakitic, Lionel Messi and Neymar, while Marc Bartra added to the rout with a sole strike. The victory and the emphatic manner of it will do plenty to alleviate the talk of crisis that had been reverberating around the Camp Nou in recent days. Along with their stunning collapse in the league, Luis Enrique’s side had crashed out of the Champions League to Atletico Madrid. And with Atletico and Real Madrid having closed to within touching distance in the league, Barcelona knew they had no more margin for error if they were to avoid their season turning from a potentially history-making back-to-back treble into disastrous failure. It had been Barcelona’s prolific front three that had fired the team to such success over the past 15 months, and it has been their decline over recent games that had unsurprisingly become the focus of attention. Between them Suárez, Messi and Neymar had scored just three time in their last five outings, a drought by their remarkably high standards. In the club’s most recent defeat, against Valencia on Sunday, Barcelona had dominated and gotten into plenty of dangerous positions, but lacked their usual clinical touch. But that decisiveness int he final third returned to resounding effect in La Coruña.